Chesapeake Utilities Corporation (NYSE: CPK) (Chesapeake Utilities) employees partnered with local Delaware and Maryland food banks to help provide Thanksgiving meals for families in need. In addition, employees from the Company’s propane distribution subsidiary, Sharp Energy, partnered with DART (Delaware Authority for Regional Transit) to “Stuff a Bus” of Thanksgiving food items that have also been distributed through the Food Bank of Delaware. Employees from Chesapeake Utilities Corporation partnered with local Delaware and Maryland food banks to help provide Thanksgiving meals for families in need. Chesapeake Utilities Corporation (NYSE: CPK) (Chesapeake Utilities) employees partnered with local Delaware and Maryland food banks to help provide Thanksgiving meals for families in need. In addition, employees from the Company’s propane distribution subsidiary, Sharp Energy, partnered with DART (Delaware Authority for Regional Transit) to “Stuff a Bus” with Thanksgiving food items that have also been distributed through the Food Bank of Delaware. More than 210 employees from the Company’s Chesapeake Utilities, Eastern Shore Natural Gas Company, Sandpiper Energy, Peninsula Energy Services Company and Sharp Energy business units, as well as the corporate office, packaged and distributed meals for families in Kent County and Sussex County. Each box was filled with the makings of a festive holiday meal, including stuffing and mashed potato mixes, milk, fresh cherries, pies and more, and then topped with a frozen turkey. 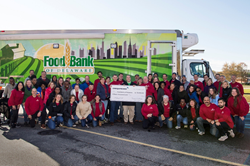 Through the Company’s annual Thanksgiving for All program, employees packaged and delivered more than 550 meals. Since the program began in 2012, the Company has donated $140,000 to provide more than 5,550 meals. The Company also introduced monthly volunteer days at the Food Bank of Delaware and Maryland Food Bank–Eastern Shore to continue our community giving and support. In addition to the annual partnership in the Thanksgiving for All program, employees from Sharp Energy partnered with DART to support their annual “Stuff the Bus” food drive. Employees filled a paratransit bus, powered by Sharp Energy propane autogas, with nonperishable Thanksgiving food staples. “Our 20th anniversary was an incredible year. We thank Sharp Energy and their employees for their generosity and support in helping us 'stuff' our buses,” said John Sisson, Delaware Transit Corporation Chief Executive Officer. “Together, as a team, we have helped to make a difference in providing food assistance to Delawareans in need.” The Delaware Transit Corporation, a subsidiary of the Delaware Department of Transportation (DelDOT), operates DART First State.